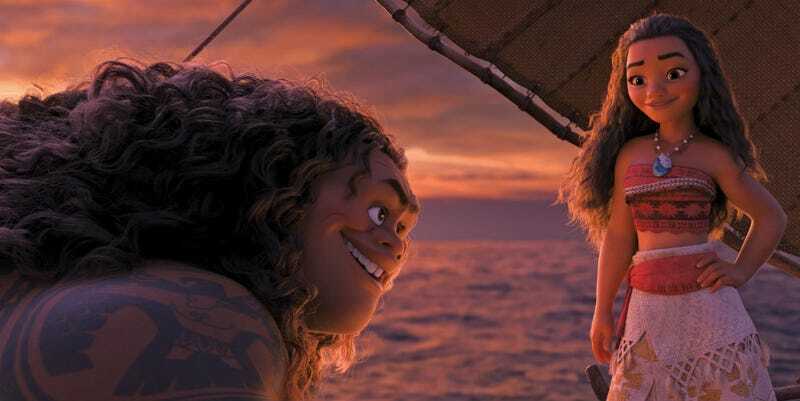 A movie like Moana doesn’t come together without a few things hitting the cutting room floor. But even when that happens, it’s rare that fans ever get to see it. That’s why something like this is so special. Below is a rough animatic of “Warrior Face,” a song co-written by Lin-Manuel Miranda and performed in this incarnation by two of his original Hamilton co-stars, Christopher Jackson and Phillipa Soo. (If it made the movie, Dwayne Johnson and Auli’i Cravalho would have sung it.) The song is about Maui getting Moana pumped to go into battle to find his hook, so it would have come before “Shiny.” Check it out, courtesy of Entertainment Weekly. It’s a catchy little song and, if the voices sound familiar, that’s because Jackson ended up doing the singing voice of Moana’s father. You understand why the song got cut, though. Maui and Moana kind of already have this mentor/mentee thing going by that point and an additional song to get her pumped up to go on such a dangerous adventure almost undercuts her strength. Without it, her fear is more believable as is her triumph. It’s all about her, instead of the credit going to Maui. This clip (and many, more you’d imagine), will be available when Moana comes to digital HD on February 21 and Blu-ray March 7.